A few months ago, I made Jake take me to this new ice cream shop off Convoy called Freeze San Diego. I had discovered they had this magical treat called “Black Magic Ice Cream” which…. hold onto your hats, folks, was BUTTERBEER flavored ice cream. Being a total Harry Potter nerd, I had to immediately visit Freeze San Diego and get this stuff into my belly. Jake made me go to the DMV with him and I felt this was just the right treat to reward me for going to a place I don’t even like going to on my own. Ha. Freeze San Diego makes their ice cream with nitrogen so it’s kind of like having fresh made to order ice cream since it’s made in small batches for you after you order it. 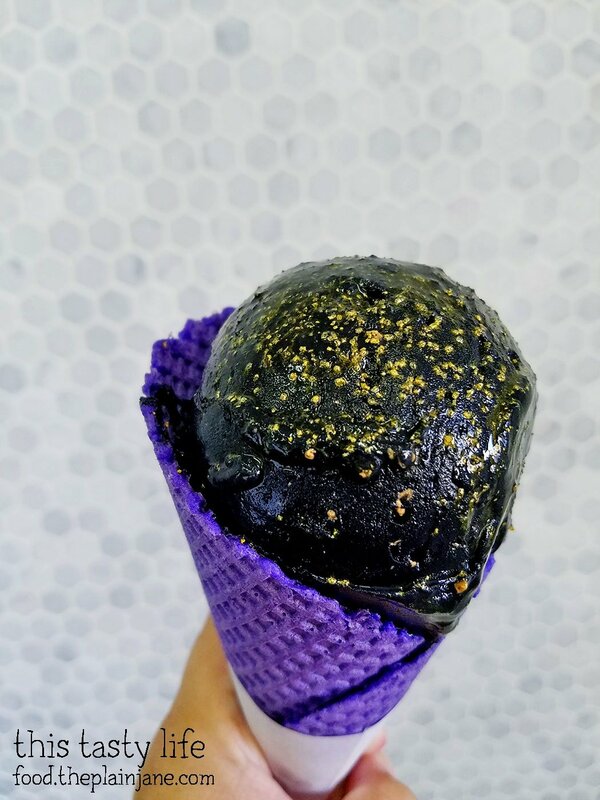 True to it’s name, this ice cream is PURE black (made with charcoal!) and full of magical flavors. It’s a bit like “butterscotch lite” since it’s a mix of butterscotch and vanilla. The gold flecks just make it looks magical and pretty while adding a little texture to the ice cream. I loved the striking black color which turns your tongue black. I liked the contrast of purple cone, too. Really delicious. 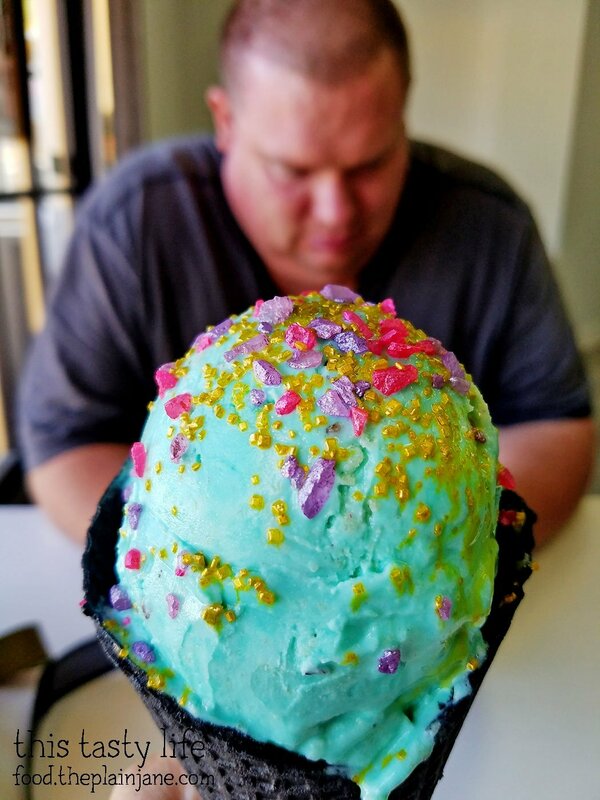 Since I liked the Black Magic ice cream so much, we went again and tried The Mermaid. This time I got the black waffle cone for the contrasting colors! The Mermaid is sea salt vanilla ice cream with pecan cookie crumbles mixed in (think Pecan Sandies). 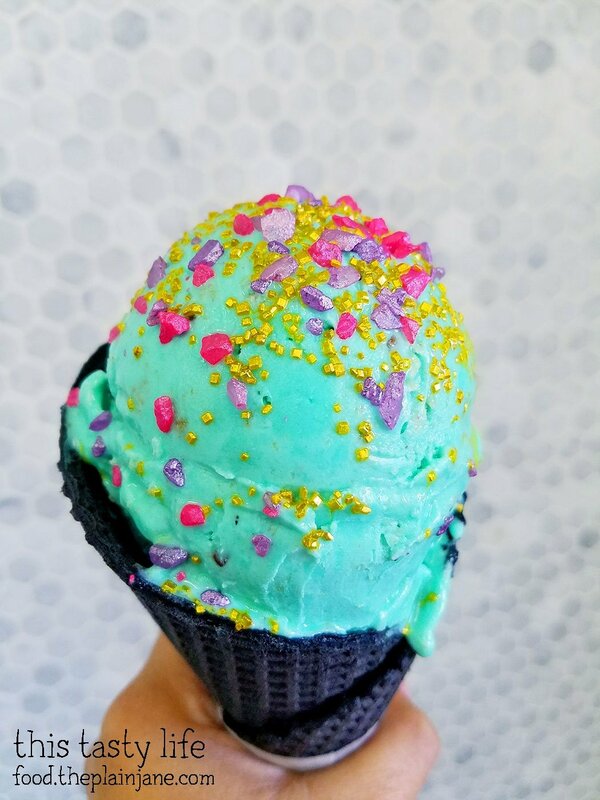 They add a bunch of pretty sprinkles on top of the blue ice cream to give it some sparkle and magic. I loved the vanilla flavor of this ice cream but my favorite part was finding the bits of cookie scattered throughout. It gave it some extra texture and flavor that I adored. This past weekend I went with a few other San Diego Food Bloggers to sample more items at Freeze San Diego! Since I had tried them out already, I knew I couldn’t miss the opportunity to sample MORE! We were treated to this new seasonal ice cream called Peppermint! It’s peppermint flavored ice cream with bits of candy cane on top. They melded the ice cream into this beautiful flower shape as well – isn’t it so pretty? They will make it into a flower when you visit, as well. Just ask! What I liked about this flavor was that the peppermint wasn’t overwhelming. Usually I’m not into peppermint because it’s too intense for me, but this was just the right amount of flavor. 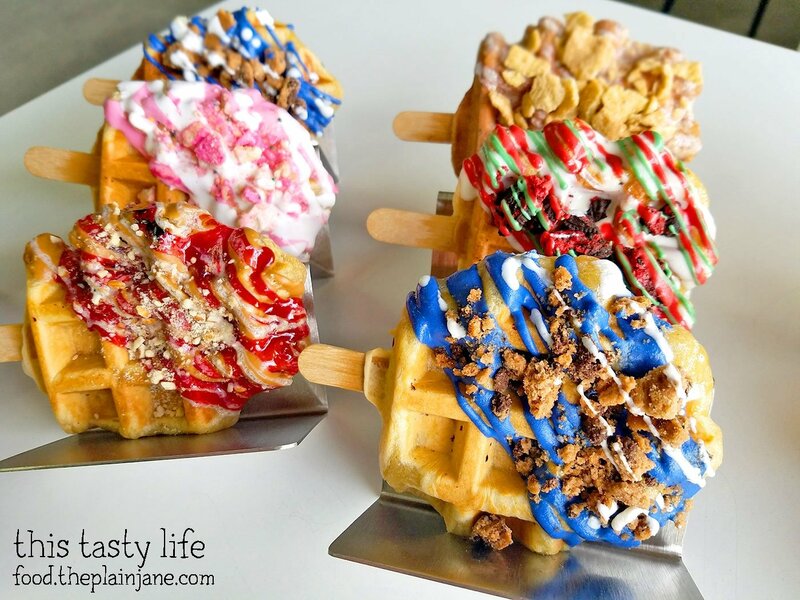 The newest items at Freeze San Diego are Waffle Pops! They come in a variety of flavor combinations. These are smaller sample sized waffle pops made for us food bloggers. I kind of dug the smaller size. 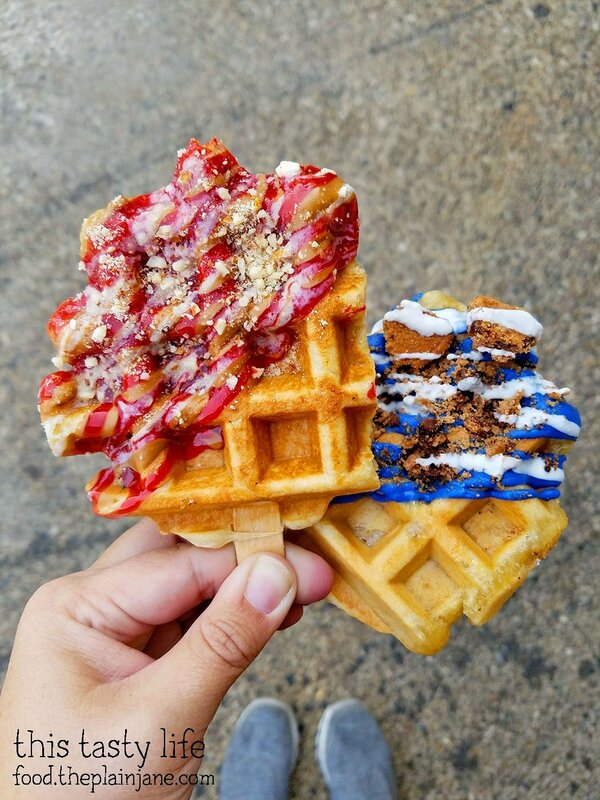 I tried two of the creations – the CB+J and the Cookie Monster waffle pops. 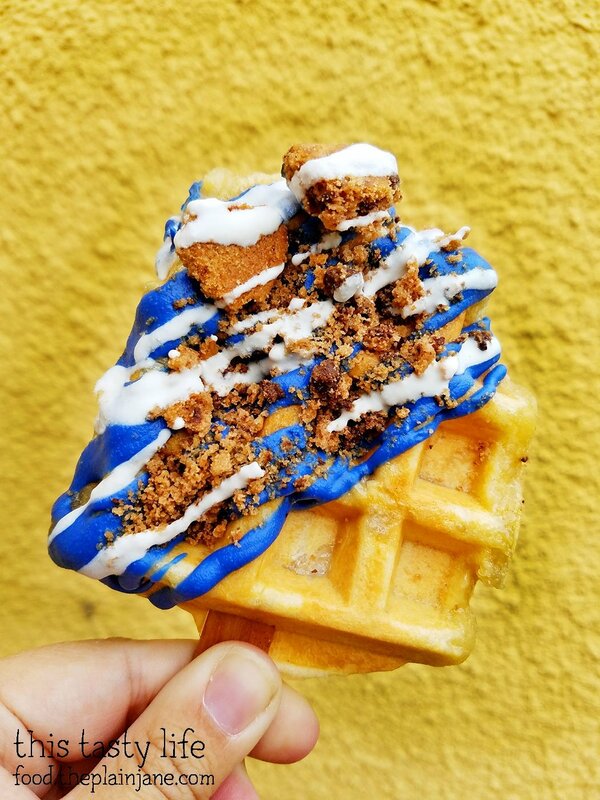 The Cookie Monster Waffle Pop has blue chocolate, chocolate chip cookies, and a white chocolate drizzle. 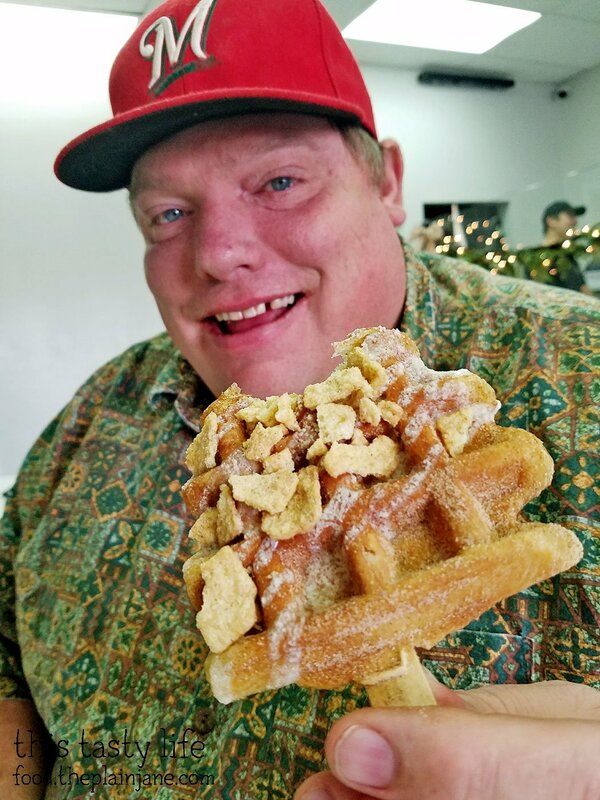 I loved the crunch of the cookies along with the chocolate and the deliciously fluffy waffle! Eating it off a stick makes it better for some reason, too. Maybe I just like things on sticks. 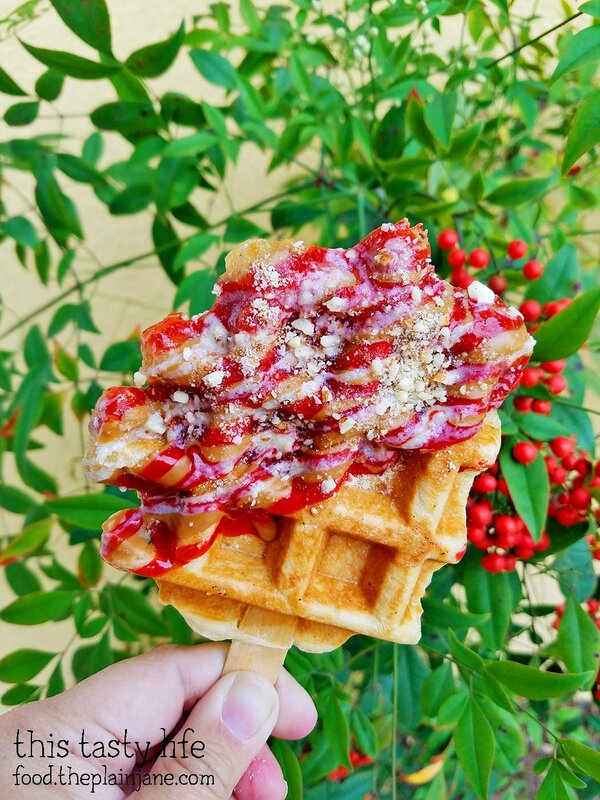 The festive looking CB+J Waffle Pop has a combination of cookie butter, strawberry sauce, and cream cheese frosting drizzle. This one has a slightly more savory taste than the Cookie Monster which I appreciated it (I was already having a major sugar high). The strawberry sauce has a little tartness to it and the cream cheese drizzle was a great compliment to the cookie butter and strawberry. Yum! Jake tried the CT Crunch (which has cinnamon sugar, cream cheese frosting and Cinnamon Toast Crunch) and the Party Animal (not shown – it has pink chocolate, animal circus cookies, and white chocolate drizzle). The CT Crunch was good – a bit more plain than the other flavors. If you’re not feeling like being fancy, this one is a good choice or the plain & simple if you just want to taste the waffle! The Party Animal was really pretty with it’s pink and white colors but it was a little overload on the sweetness level for me. But maybe that’s because I tried it at the end when I was already past my sugar limit. Ha! 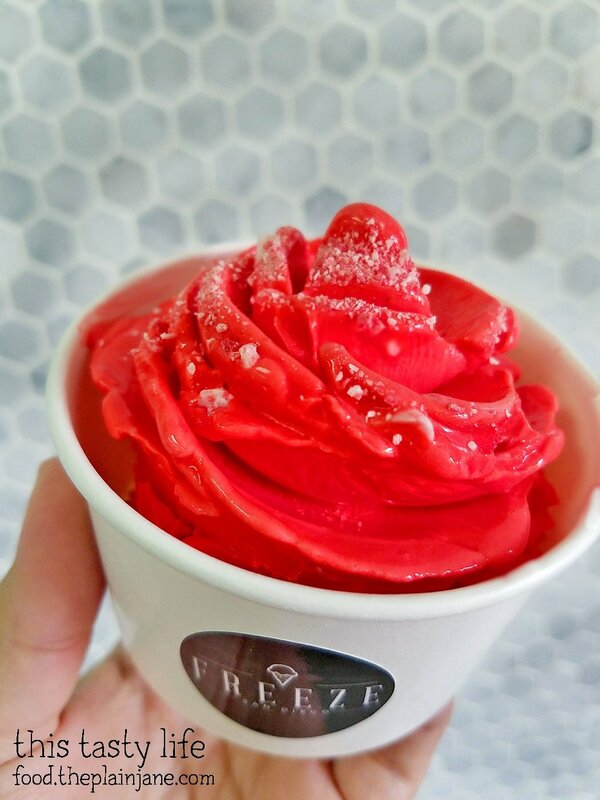 Freeze San Diego has some really great dessert combinations – it’s a cool spot to hang out for a treat! 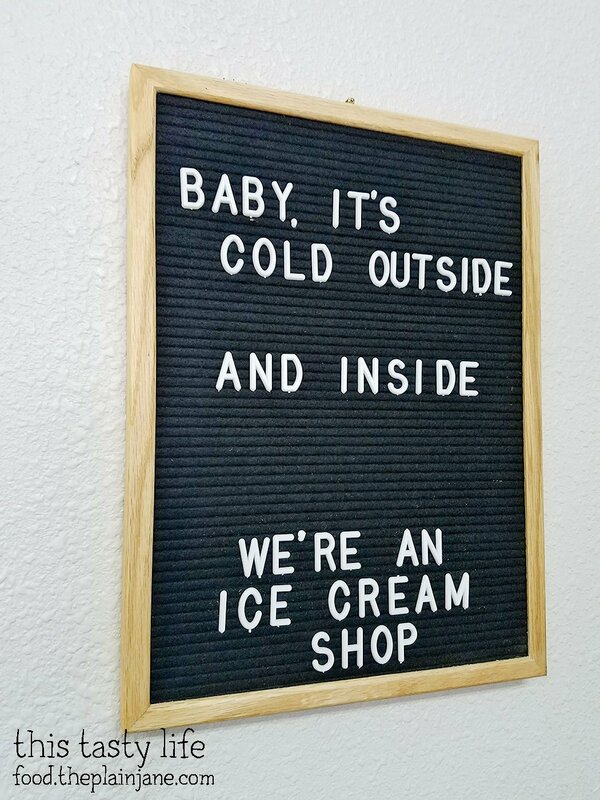 If nothing else, you gotta come in and try those ice creams – they are killer! Note: I was invited to Freeze San Diego and received complimentary items (Peppermint Ice Cream and Waffles Pops). I was not further compensated for this post and all opinions stated here are my own. Wow, Mary teacher! I want to try the charcoal one. I can’t remember the last time I tried an ice cream flavor that I haven’t tried. I think the last one was probably cheddar cheese. I guess Freeze isn’t a franchise? I checked to see if there were any in LA/OC. I guess not! Hi Miss Kim! Yeah, this isn’t a franchise. It’s good though, if you ever visit SD you’ve got a place to try! Have you been to Salt & Straw? They have some really interesting/unique ice cream flavors I haven’t seen before. I’ve been to the one in Portland but they also have locations in LA. When did ice cream get soo pretty… gone are my childhood days of hearing the ice cream truck and getting a spongebob popsicle with creepy gumball eyes! Haha, I know, right?! I remember those simple scoops from Thrifty ice cream and that seemed to be as fancy as it got! Hi Lynn! I didn’t see the regular size myself but I saw a photo, it looked maybe… twice as big? Little less? And they put chocolate/decor all over the top, not just half. The regular decorated ones are $5.50 and the plain waffle is $4.50. Too bad you couldn’t make it! Wow, the Mermaid cone looks so pretty. I personally don’t like the look of black ice cream though. Anything with charcoal in it seems a bit too trendy for me. The waffle pops are interesting as well. I’m guessing this size is not a regular menu item since you mentioned it was made for a preview event for food bloggers? Seems like a lot of food and desserts nowadays are designed to be “instagrammed”, ha ha. Hi CC – Yeah, a lot of things are made for instagram purposes! The black ice cream was actually really tasty, I just didn’t like that it turned my tongue black. Ha! The waffle pops are a smaller size but I thought they were a fair size! Not sure how big the “regular” ones are, they are working on doing a flight of waffles and are trying to make smaller ones.